Have fun at top family attractions, enjoy great food at some of the finest restaurants in Newquay or explore rockpools and hidden coves on Newquay’s beaches – the choice is yours! And you don’t have to travel outside the local Newquay area to see or do any of it. Cornwall, and Newquay in particular, is a fantastic place to be for those who love life outdoors. 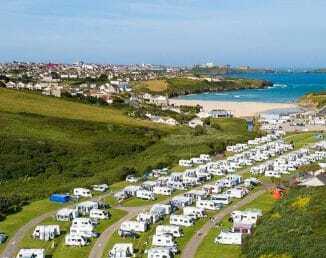 At Porth Beach Holiday Park you’re located just 150 yards from the beach – the perfect place to pick up the South West Coast Path. Walking north or south, you can enjoy some truly spectacular cliff-top views. Head towards Watergate Bay and Bedruthan Steps or Crantock and Polly Joke for some unrivalled views. For adrenaline junkies wanting non-stop action there’s things to do in Newquay for you too! Try your hand at Coasteering, Sea Kayaking, Kite Surfing or Wind Surfing! Watergate Bay’s Extreme Academy is the place to be for these extreme sports, with expert instructors on hand to show you the ropes! If there’s one thing the Newquay area has in abundance, it’s staggeringly beautiful beaches. From small coves with turquoise waters to vast expanses of golden sand, there’s a beach on the Newquay coast to suit everyone! There’s 7 to choose from in the immediate Newquay area, including the world famous Fistral Beach, or head further south to discover beaches at Polly Joke, Holywell Bay and Crantock. Go north and see Watergate Bay and Mawgan Porth. Or, just enjoy the beautiful Porth Beach just 150 yards from our holiday park! Whatever your favourite food may be there’s something to tickle your tastebuds in Newquay. Head to Jamie Oliver’s Fifteen Cornwall restaurant at Watergate Bay (or the Hotel at Watergate Bay next door) for some truly sumptuous dishes – and with an amazing view of the Atlantic Ocean too! Or head into Newquay to sample a wide variety culinary delights, from Indian and Mexican to Italian and good old fish ‘n chips! And for that latter why not head over to Rick Stein’s at Fistral Beach? No holiday to Newquay is complete without sampling some of the great local events that take place throughout the season! From carnivals and parades to zombie walks and gig races, there’s so much to see nearby! This September why not head over to Newquay Harbour and catch all the action at the Newquay Fish Festival. Held from September 16-18, this festival celebrates the town’s fishing industry. Get ready for live cooking demonstrations and plenty of entertainment! So, for some fantastic things to do in Newquay you really don’t have to venture far! For more inspirational adventures, check out our 50 things to do in Cornwall guide here!